Of all the things superhero stories do well, they are most well-suited for exploring questions of identity. Masks and secrets are uniquely associated with superheroes and baked into the drama of their stories. A secret identity is a handy metaphor for the universal tension between who we are and who we think we are, or who we want to be. The process of self-discovery is messy, uneven stuff that doesn’t always develop as expected. Part of the cathartic fantasy of superhero stories, then, is being able to decide how you will be reinvented, or who you will grow to be — and then unveiling that person to the world all at once. Of course, there’s no guarantee that will go smoothly, either. This week’s episode, “Crossfire,” is all about identity. 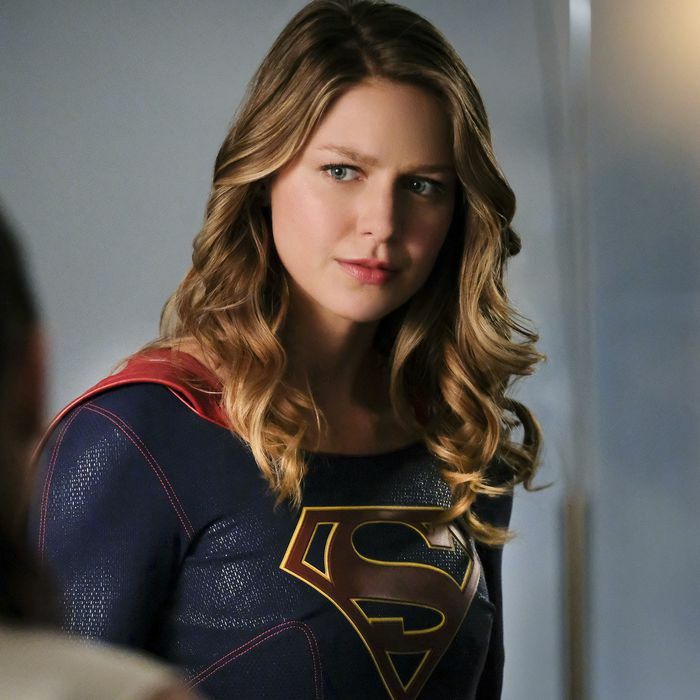 It’s a terrific hour of Supergirl that finally takes a moment to let us consider its new status quo and see how its characters have adjusted. As it turns out, everyone is working through some stuff! It’s pretty remarkable how the episode introduces compelling yet succinct story arcs for Supergirl’s main cast members — even a few neglected ones — while making them all feel tonally appropriate and complementary. There’s the comic story of Mon-El trying to become Mike Matthews, the more tragic one of James Olsen’s helplessness in his role of perpetual sidekick, Alex’s slow journey of discovery as she learns about her sexuality, and Lena Luthor’s continued efforts to prove she is more than her family name. It’s all so well done that I don’t really mind that this week’s villains — a group of common criminals supplied by Cadmus with alien tech, so Cadmus can stoke the public’s fear of aliens with the chaos they’ve created — are pretty lame. (Also, there’s no terribly clear connection to the comics. I suspect they’re more or less a riff on Intergang, but with none of the recognizable characters from that team of bad guys, probably because they’re all killed by episode’s end). Of course, even if Winn is right — and it’s not clear where Supergirl is going to take this particular story — James has to arrive at that conclusion himself. Until then, Winn decides it’s more important to support his friend, and help him secretly build his own identity as a crime fighter. Similarly, it’s becoming clear over this first clutch of the season’s episodes that Alex Danvers may have some exploring to do when it comes to her sexual identity. Early in “Crossfire,” Maggie Sawyer calls out Alex’s friendly flirting after finding out Maggie broke up with her girlfriend (wow, that was fast). And make no mistake, it’s totally flirting. “I didn’t know you were into girls,” Maggie says. “I’m not,” Alex replies. “You’d be surprised how many gay women I’ve heard that from,” Maggie suggests, entirely without judgment. Whether superhero or civilian, when you decide the kind of person you are or want to be, you have to begin the messy work of actually being that person. And that’s hard. There’s no real guidebook. But maybe it’s a little bit easier when you have a friend like Kara Danvers, flying around with that symbol on her chest, chasing the person she wants to be like the rest of us. I was ready to go on this whole tangent about the woman who mysteriously runs Cadmus where I just called her Lady Cadmus and detailed her machinations and speculated on who she would be but then the show just went ahead and revealed it! Lady Cadmus is LENA LUTHOR’S MOM … WHAAAAAAAT. Next week, it looks like the show will take on Parasite and I cannot wait.